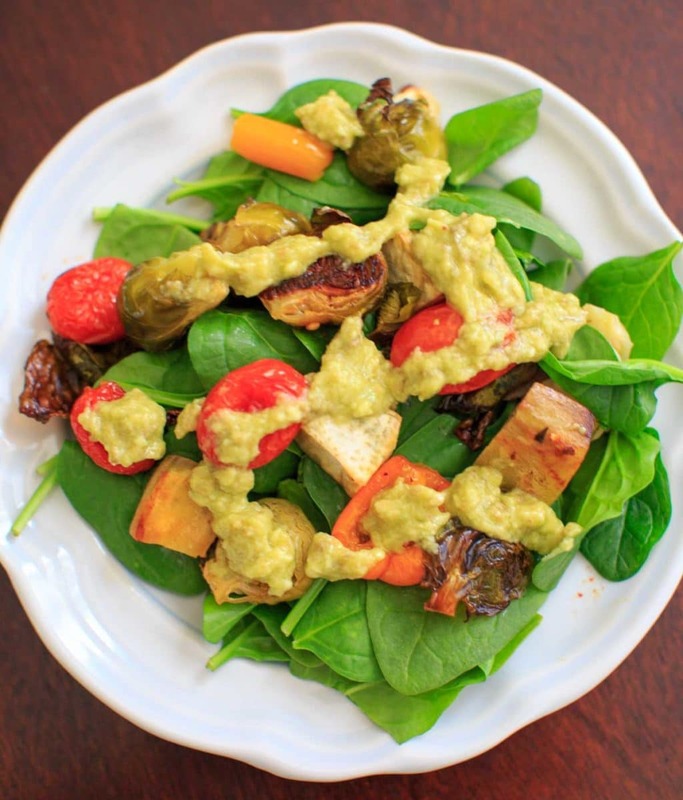 Roasted Vegetable Spinach Salad with Avocado Dressing, a.k.a. 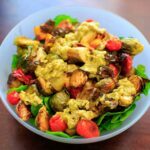 “Leftover Veggie Salad.” Use up your vegetables or roast your favorites for this healthy vegan and gluten-free meal! Seriously, it’s a shock I haven’t yet had a post specifically to use up leftover vegetables! Until now. More than once I’ve told you how I overbuy vegetables. Or sometimes I buy some for a specific purpose, and then have random pieces parts leftover. Have you ever heard of a “kitchen sink salad?” It’s shortened from “everything but the kitchen sink” and basically means you throw in anything and everything you’ve got. It’s a good way to use up veggies that are not going to last much longer, or a lazy creative way to eat the rainbow. Here I used brussels sprouts, mini sweet peppers (leftover from these poppers) and sweet potatoes. Tomatoes were also thrown in but that’s not technically a vegetable. Toss them in some olive oil, salt and pepper and roast until tender and browned. The measurements are very flexible. I roasted 6 cups of vegetables with 1/4 cup olive oil. The goal here is to just use up what you have. I ended up having leftovers of my leftovers because that’s a lot of roasted veggies! Rough guidelines to make it into a salad one serving would be about 1 cup fresh spinach or greens (2 ounces) topped with 2/3 cup roasted veggies. But you can choose to load it up with more instead. As for the avocado “dressing,” it’s just avocado, lime, olive oil, salt and pepper. Basically a very simplified version of guacamole. Even better if it’s an avocado towards the end of it’s prime, just since we’re in the spirit of not wasting food. And there you have it! I used up a bag of spinach, 2 sweet potatoes, several cups of brussels sprouts, a few sweet peppers, tomatoes and avocado. Even the last lonely lime in the drawer! What veggies will you use? 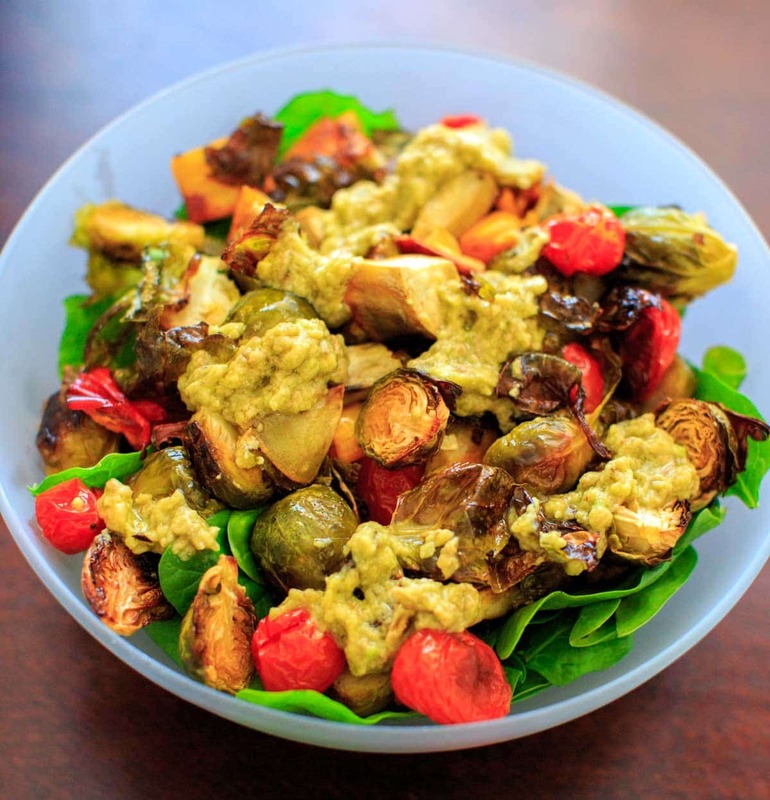 Roasted Vegetable Spinach Salad with Avocado Dressing, a.k.a. "Leftover Veggie Salad." Use up your vegetables or roast your favorites for this healthy vegan and gluten-free meal! Preheat oven to 400°F. Spread chopped vegetables on a baking sheet, drizzle with olive oil and toss lightly to combine. Top with salt and pepper and roast for 30-40 minutes, or until tender and lightly browned. 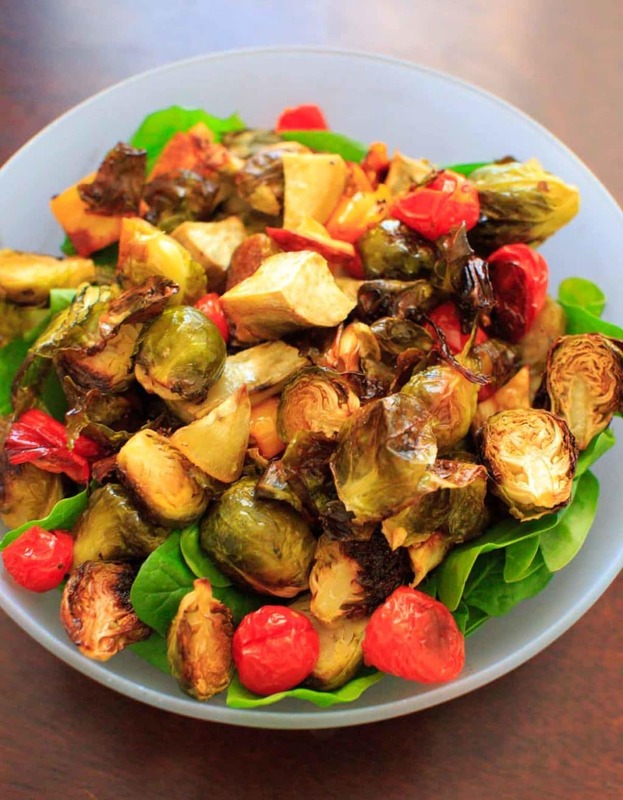 Layer roasted vegetables over a bed of fresh greens or spinach. In a small bowl or blender, mash together avocado, olive oil, lime juice and salt for the dressing to top the salad. For roasted vegetables: can use whatever good roasting vegetables you have available and as much as you want. I roasted 6 cups of vegetables at once (half brussels sprouts, 2 sweet potatos, a few mini sweet peppers and a handful of tomatoes). Other good options include butternut squash, regular bell peppers, broccoli, carrots, mushrooms. Great leftovers idea! A combo of all the delicious veg! I love leftovers and this is a great way to use leftover veggies. Thanks! Great idea to use leftover veggies:) liked your recipe! I love how you made roasted veggies into a salad and topped it with a dressing too. 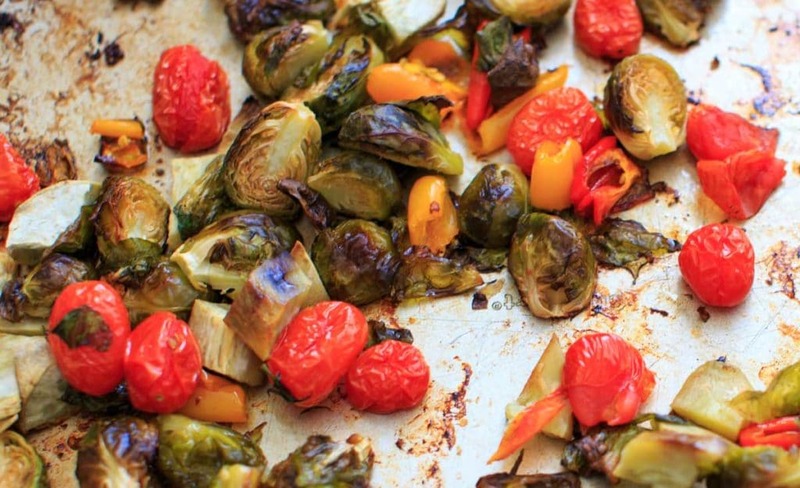 We usually just eat roasted veggies as it is – this will be a welcome change in the household!